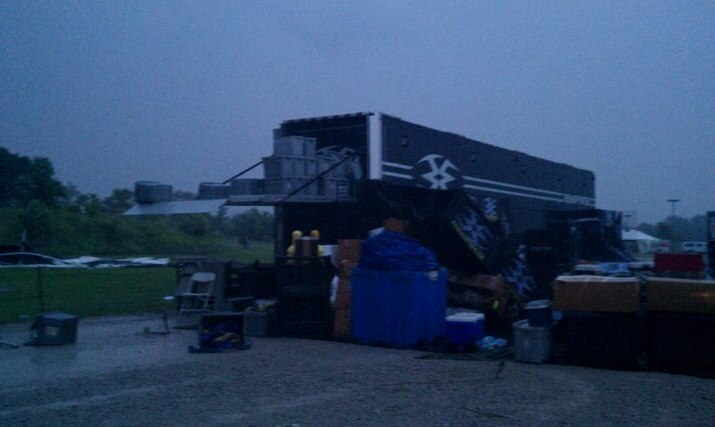 Nature called and the PSP Chicago Open is off to a rough start. 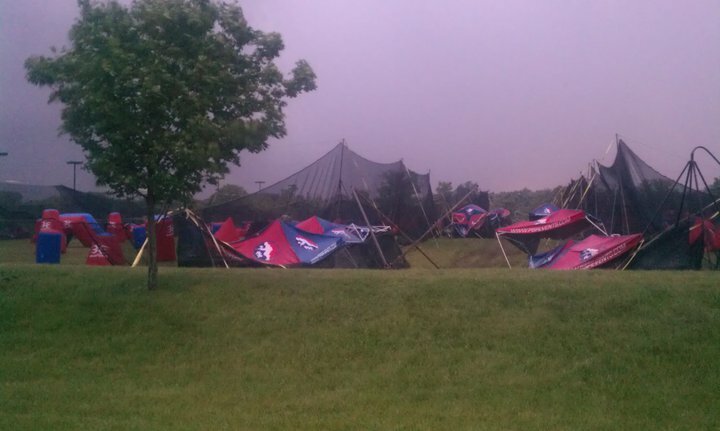 Last night a mixture of bad weather — heavy rains and high winds pounded the CPX Sports park. The PSP’s 6 perfectly set up paintball fields, pitting areas and vendor booths were hit hard. Don’t fret though, the PSP is working quickly to repair the damage and get the pro paintball games off to an early start. Here are a few photos courtesy of Empire Paintball and the PSP. 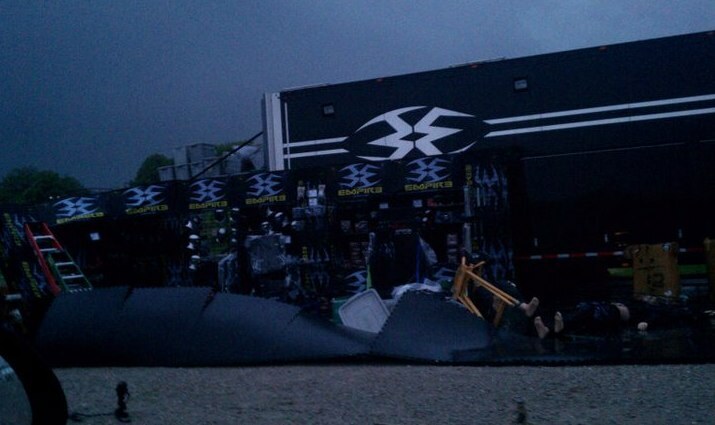 These photos document the extensive damages of the PSP fields and vendor areas. Read below for an official update from the PSP’s Camille Lemanski. I need to be very clear: the venue was hit hard. There has been extensive damage and we are faced with the greatest challenge our crew has ever had to get through. We have 14 poles that have snapped in half with another 2-3 bent beyond repair. At least 3/4 of a field of netting is gone as well as plenty of cable damaged. The pit area is a tangled mess of metal, netting, cable and air hose. We have yet to test the scoreboards and some other areas, but have a better idea of what needs to be done to pull this event off. It is going to be very challenging, but we are the best in the business and if anyone can make this event not only happen but make it a success; it’s the PSP. Our team must get into the pits to clear all of the debris out, then rebuild the pits and re-run the air hose. They must take down the damaged portions of the 6 fields and rebuild 5 solid fields. This means slightly longer days and teams will likely need to play an extra game on one day. While our crew work to clean up the mess and rebuild the fields, we ask for teams to wait until at least 4 pm to walk the fields. Registration/Team Check-in will be open at 1 pm today as scheduled but again, no field walking until further notice. On the bright side — the weather in Joilet, IL is said to be improving and the sun is predicted to show itself in time for the weekend. Like Camille said, the PSP event staff and CPX field staff are veterans when it comes to putting on major paintball events. The schedules may be pushed back and more games will be fit into each day but the show will go on. Will the weather improve or impact your teams performance at the event? What type of preparations are you and your team making in anticipation of the event? Poncho’s and visors for your goggles? Or, t-shirts and sandals? Share your tips in the comments below.